Home Uncategorized What Are the Chances of International Spread of Ebola? What Are the Chances of International Spread of Ebola? While the fight against Ebola in West Africa continues, there are many who are concerned with the probability of Ebola spreading internationally. While there have now been documented cases of Ebola infected people travelling to other countries, what are the actual chances of the international spread of Ebola? A recent study published in the Lancet has described data assessing the probability of Ebola spreading internationally via air travel. With increasing concern of international spread, the authors sought to provide information from which policy makers could make evidence-based decisions when considering the role of air travel in the spread of Ebola. The study drew on global population mobility via air travel data in addition to available Ebola virus data, and information regarding international health care systems and their ability to deal with potential imported Ebola cases. The air travel data was assessed from the three countries currently dealing with the largest proportion of the outbreak: Guinea, Liberia, and Sierra Leone. Since these countries currently have the greatest number of Ebola cases, the assumption would be that the greatest chance of international spread would come from one of these three countries. Data used for the study was obtained from the International Air Transport Association. The study reported estimates of Ebola-infected international air travellers departing Guinea every 2.7 months, Sierra Leone every 0.6 months, and Liberia every 0.2 months. 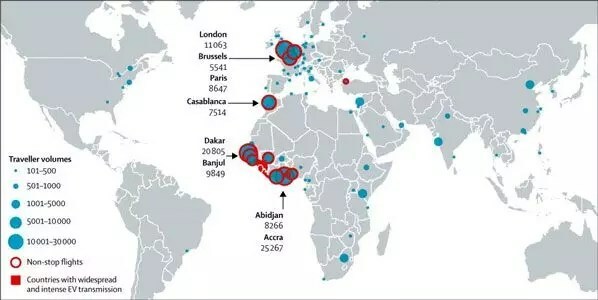 They also reported on the most common destinations of the air travellers, and therefore the most likely locations of Ebola’s international spread. When analysing the data, the assumptions are that pre-Ebola rates of air travel continue, with no health screening at airports. Final traveller destinations, passenger volumes * and scheduled non-stop flights† departing Guinea, Liberia, and Sierra Leone (Source – The Lancet doi:10.1016/S0140-6736(14)61828-6). In addition to airport screening at entry and exit points, the authors of the study suggest that another way of attempting to reduce the spread of the disease, without compromising the supply of medical professionals and equipment to the affected nations, could be to bring supplies and medical aid via non-commercial flights. It is important to maintain high standards of care in affected countries, as the best chance to prevent international spread is to curb the epidemic at its source. In addition to airport screening, international medical facilities should have systems and procedures in place for early detection and treatment of potential imported cases of Ebola. The authors point out the concern that a high proportion of travellers exiting Guinea, Liberia, and Sierra Leone have destinations within low, or lower-middle income countries. The concern here is that these countries are not as well equipped to deal with possible spread of Ebola compared to higher income countries. In addition, ground travel is also of concern, since it contributes to a high proportion of local travel within the region. The authors of the study aimed to provide valuable information to policy makers, stating that imposing travel bans to or from Ebola affected countries has to be carefully weighed, while on the one hand the aim is to decrease the risk of the international spread of Ebola, adverse effects on countries currently fighting the disease have to be taken into consideration, including health, economic, social, and humanitarian consequences. Previous articleAre Eggs Good or Bad for Cardiovascular Health?